Online file storage services allow you to save, browse and share files, photos, and documents from any computer or mobile device. 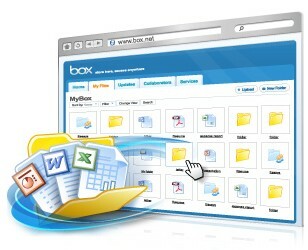 Box.net is a service that allows you to have 1GB of free online storage without ads. You can have 5GB for $5 a month or 15GB for $10 month. The only limitations of the free account are: 10MB file size limit and no phone support. Yuntaa is currently in Beta mode and offering Free Accounts for everyone, although you can sign up for a paid account if you’d like more storage space. Your Free 1GB account will remain free even after it moves into production mode. Handshake is the place to meet your next friend, programmer, project manager, accountant, interface designer and more. By adding someone as a contact here, you can collaborate online in 8apps. Handshake is social networking with purpose. BlueTie.com is a free Web-based email, calendaring, and file sharing for new and growing businesses. Each account includes up to 20 users with domain name support. Calendar Online – an integrated online scheduling application to help you manage your personal activities and track team and resource availability. Cash Flow management software enables you to stay on top of your finances and avoid the number one reason why small businesses go out of business. Contacts Online keeps a secure and easily accessible central database of business contacts for your team. Business IT Online’s unique contact filter allows you to store contacts as individuals or companies and find the contact details you need, much faster. Documents Online If you want to work from home as well as the office, it might seem like a distant dream to be able to access all of your important files from multiple locations. Business IT Online is your solution. Marketing Online is a free online business profile (a ‘BIO’) to promote your products and services and win new business. You can always make a copy of your own DVD to iPod. Converting DVD to iPod is a rather straight forward process. You will require several tools. To convert DVD to iPod you can make use advanced DVD to iPod Converter software, which simplifies the process of convertion and reduces it to several simple steps, or you can use freeware DVD Decrypter and freeware Videora iPod Converter. With this free software and our step-by-step tutorial, you can add any DVD from your collection to your iPod. The conversion process is performed in two steps. First you need to copy your DVD to your hard drive, where you convert it to iPod-compatible format. Next you need to copy the content to your iPod with the help of iTunes. The steps to convert your DVD are given below.